The 20'x28' 4-wall inplant office comes standard with 8' tall ceilings. Also available in 9' tall ceilings. Every modular office system comes with the Easyrack Advantage. When you choose the Easyrack Advantage, you’ll get a custom designed modular office system that is pre-engineered and manufactured specifically for your needs. Every modular building, whether a single one-story office or a large two-story complex, begins with selection of the system that best fits your application. 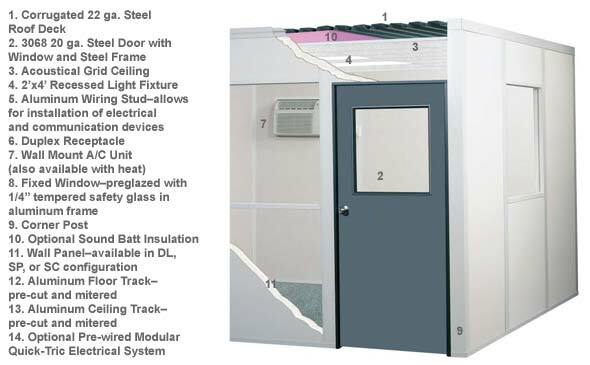 3” thick wall panels are completely self-contained, allowing your structure to be reconfigured easily and conveniently. ..Windows, steel or wood doors, a steel roof deck and drop ceiling system, an electrical system, and a variety of other options to maximize the functionality. Our quality packaging minimizes shipping damage and the resulting delays. From initial design to finished installation, the Easyrack Advantage can insure that your project runs smoothly. Standard panel colors are khaki, grey and white (custom colors are also available). The SS3000 is a two-piece stud that allows both sides to be equipped with electrical devices and communication receptacles. Wall panels are available in three standard colors: Khaki, White and Grey. Optional wall finishes are available including painted aluminum, painted steel, fiberglass reinforced plastic and more. Electrical options include standard field wired components or the exclusive modular Quick-Tric pre-wired electrical package.